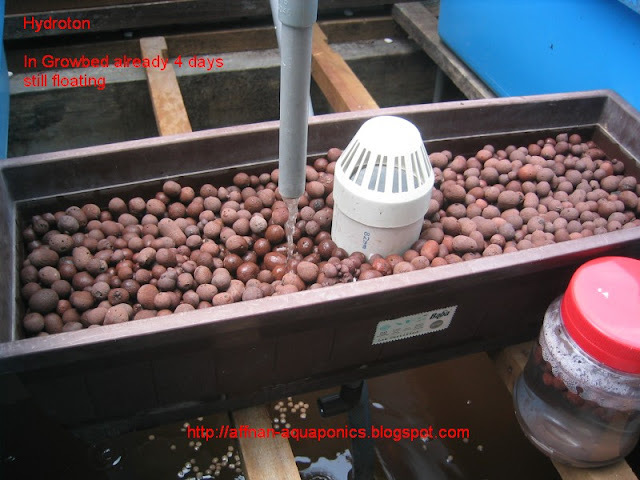 I am testing Hydroton usage in Flood and Drain Aquaponics, my previous trial was no good. I left a bucket full of Hydroton few weeks in a pail of water to see whether it will settle down, it did not. This current test, I am conducting is a simple one. Hydroton in a jar soak in water, maybe this time it will sink to the bottom and use able in flood and drain Aquaponics. 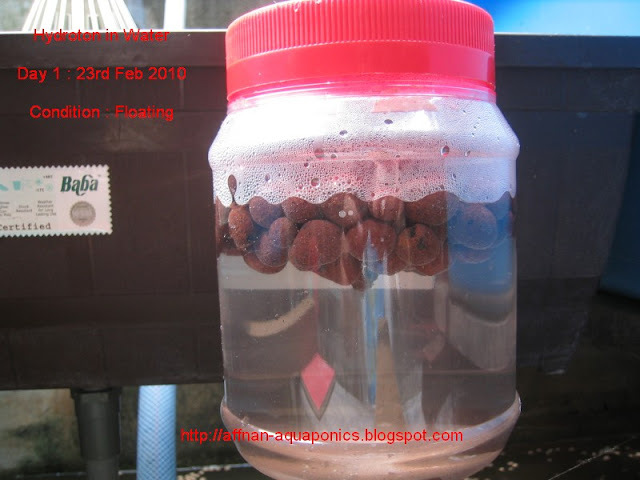 I need to verified that Hydroton can be use in Flood and Drain Aquaponics and will update this post on the progress. Hydroton above in this mini set still floating up and down with the water cycle after 4 days. Will see how long it will takes to fully settle down, otherwise it will be difficult to use it in F&D Aquaponics. After 5 Days its still floating, the one in my mini set is still going up and down with water cycle. It could be this is the wrong type of Hydroton. If I not mistaken there is another type of hydroton (Leca) use for aquarium which are not float but slightly smaller size. Any idea where I could get these Leca, or any picture of it can be found. It must be cost effective otherwise not economical for Aquaponics. @Rasid, just check Leca these is generic name for Hydroton. Its the same thing. Hi Affnan, yes Leca is generic name for Hydroton and it is the same, for the hydroton that not floating, it is for aquatic (aquarium plant)and the price is slightly higher around 20%. It name still hydroton but the package wrote word Aquatic. Sorry I have no picture and if I happen to passby that shop I will try to take photo. I just want to share info. Nice and infomative blog you have. Thanks. @Rasid, I see it available at aquarium shop, then again its expensive and may not be feasible because we need alot for aquaponics. Hello Affnan, thank you for your blog. Very informative and helpful! What type of medium (and what sizes) do you currently use in your grow beds? @Anon, I use pebbles. I mix 40% 5mm -7mm and 60% 10mm -15mm pebbles. This is just a rough estimate. If you can get river gravel is much better. @Dan, Yes its still floating. Maybe the type that I have is the wrong one. Hydroton in the picture is very light. It like 1/10 the weight of river pebbles. The water should drain just below the top of the rock. Drop ya drain level. 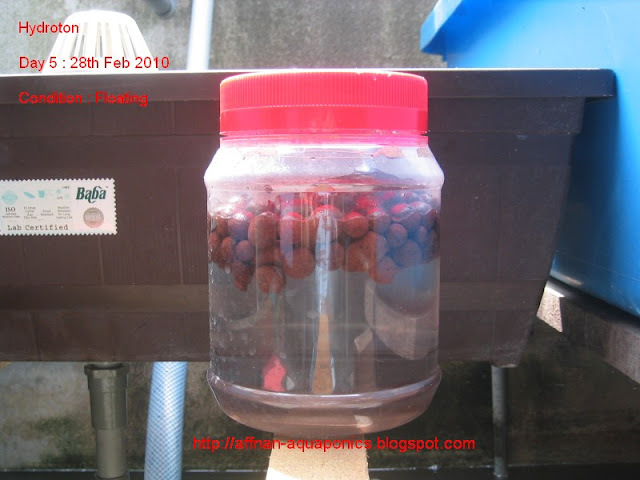 This was an old test, type of hydroton use at the time is not suitable for Aquaponics usage, since then I manage to get the correct type and it works without any problem.